TRUE LOVE VISIONS - Fortune Telling :: sidetaker. Welcome to the spiritual world...I have over 15 years of experience as I have helped my family, friend, relatives as well as many people across the world. My predictions have always come true, I can see deep insights and let you know the real visions. I can help you know who your soul mate is and who you will be in long term relationship with, I can answer your all questions whether it is about your love life, career, and money, and health, sexuality based on my knowledge, experience, powers, angels and guides. I can connect you with my psychic abilities, draw a tarot card, read on the basis of astrology or numerology to answer all love and relationships and other questions relating to any area of life. I can read past, present and future, analyse your dreams, forecasts your career. Solve issues of sexuality, intimacy. I can cast spells as well remove the negativity with my prayers. Please start chat and contact me, you will not be disappointed. Many blessings. I am born psychic and blessed spiritual adviser. 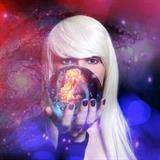 I am a gifted psychic with over 15 years’ experience who has helped, guided, and directed thousands of people around the world. I have been working for over 15 years. I will look into your situation and with my tarot cards and psychic abilities I will find the right path for you… Remember that life goes up and down, and there is no straight path for anyone. If you are having a bad time, life will always get better further, but you have to make an effort too, just by providing me the basic details like name, date of birth and gender, you can have all answers to your innumerable questions no matter what area of life it is. Best wishes and I hope to assist you very soon on your life’s precious journey to enlightenment. Slow typing and super slow responses - maybe it was her connection.. Her reading came true for me exactly 2 weeks like she mentioned!